By acefest on August 18, 2010 in Industry News, Misc. 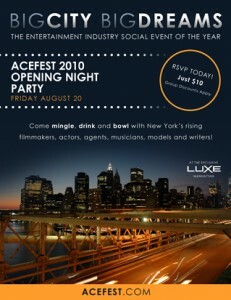 Don’t miss out on this incredible opportunity to meet, mix & mingle with rising stars in the Entertainment Industry at one of Manhattan’s most-exclusive private lounges, Luxe! This is your chance to make priceless, lasting connections with actors, filmmakers, producers, writers & casting directors from all over the country. Online RSVP is required to attend.